Grammy and I both couldn’t wait for the Superbowl. Both for very different reasons. Although she has resided in New England for more than fifty years, she loves Peyton Manning. I, on the other hand, wanted to see halftime: Bruno Mars and Beyonce on the stage at the same time! I was expecting the usual girl power message with some killer dance moves from Bey and hair all over the place. I was right but there was so much more. Beyonce had the audacity to dress in Black Panther Party motif while dancing to her new single “Formation.” It wasn’t just the 50th anniversary of the most watched television program in America, but also the 50th anniversary of the Black Panthers, also Black history month during the presidency of the first black president. Former mayor of New York City, Rudy Giuliani said that Beyonce, “used it as a platform to attack police officers, who are the people who protect her and protect us, and keep us alive.” The Guardian newspaper wrote, “Beyonce’s Formation Reclaims Black America’s Narrative.” All agreed that Beyonce stole the stage. 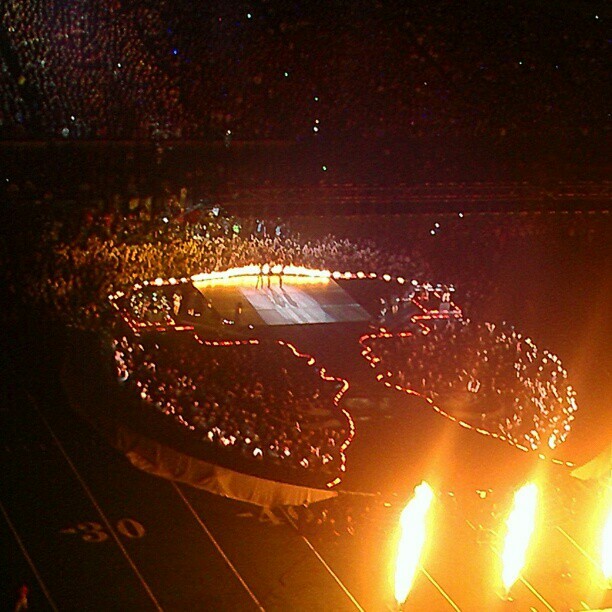 The halftime performance was put on in typical Beyonce fashion. There were bold dance moves by a group of women. Bruno Mars sang his hit “Uptown Funk.” But then the camera flashed to a drum line and behind Beyonce called, “Ok ladies. Now let’s get in formation.” If you were too mesmerized by the booty shaking of Bey, you could easily miss the mixed messages of her dance moves and song lyrics. Beyonce throws up the Black power fist, while telling ladies they could be the next Bill Gates in the making! To young women around the world Beyonce represents something to strive toward. She is what millions of women and girls listen to when they wake up in the morning, get dressed, and go to school or work. They listen to her sing about girls running the world….she wakes up like this, “Flawless.” She sings about how she is, “A grown woman, and I can do whatever I wanna.” Women all around the world feel powerless for simply being a woman but Bey gives amazing strength to millions of women of all colors. She is rich, powerful, and beautiful in the eyes of young women and when living in the horrible reality of a world that gives economic hopelessness, daily sexual violence, and exploitation at the workplace, Beyonce’s life is seen as something to strive for. In one of Bey’s performances she had the word “feminist” across the screen. But the type of gender equality she is singing about doesn’t quite line up with the type of feminism that is needed to truly challenge the system that implements sexism. Beyonce, like Hillary Clinton, speaks about a feminism that puts women on the same playing field as men in the corporate world. Giving women the ability to make as much money as men do. But at what cost and for which women? The making of a few more rich women will not end poverty and exploitation for the rest of us. True feminism is fighting for all women, giving them access to reproductive health care facilities, free childcare and fair wages. Beyonce brings up sexism and inequality, but to fight for those things it takes a lot more than singing. We must organize in the streets, universities, and workplace. Beyonce’s solution for equality among the genders is unrealistic for the majority of women. She sings about getting revenge with “your paper.” How about she tells that to a single mother of three working two full-time jobs? Most working women never see much of “their paper” because the money is spent before the check is cashed. When someone challenges the patriarchal system, we must embrace that. It is a good thing to challenge patriarchy. But then we must take it a step further. Where is that oppression coming from and how do we fight it? Now, the way Beyonce challenges it is by trying to join it. But as a woman, even as a privileged woman, one of the most famous pop stars around, she is still a woman, a black woman at that. And so what does she do? She takes on the stereotypes of black people and black woman specifically: things like hot sauce in her purse and buying hair weave. But then also showing how she is proud of her daughter’s natural and curly hair. But then she will tell women in her song to bow down to her like in the song “Flawless.” We don’t need to “bow down” to Beyonce or anyone else, we need to organize and fight. Capitalism is a system that breeds racism, law enforcement terror and environmental destruction rooted in maximising the profits and wealth of a tiny minority in society. In order for us to survive, we must sell ourselves to a certain degree. Women are further exploited as artists compared to men, and are forced to use their bodies and sexuality to sell music. Unfortunately for us, capitalism controls our culture. But that should in no way take away from the important political message Beyonce brings us through her art. Beyonce and the director Masoukas brought the reality of racism in America to the screens of millions of people. But it wasn’t for their desire to lead the struggle. It was a reflection of society and the struggle that already exists. She shows what brutality looks like, the little black boy in the hood, who has become the symbol of who gets killed by the police. She shows in her video the victims of Hurricane Katrina in a city that is predominantly poor black, that has just been ignored since 2005 after one of the most devastating unnatural disasters in the U.S. which still has thousands of people displaced. A city that attracts many tourists a year for its rich and troubling history. Pop culture icons have spoken out against social injustices. Paul Robeson, Ozzie Davis, Ruby Dee, Nina Simone, Harry Belafonte and Muhammad Ali took stands on issues. Because of their social weight, they have access to much more than the average worker. But even those that benefit from certain privileges such as class, still are functioning within a patriarchal system. Therefore artists like J. Cole and Kendrick Lamar do not have to sell their bodies to make a dollar nor a statement. They are men of course and can simply rap about anything. Like “The Tale of Two Cities” for example. But Bey is a woman, a black woman at that and therefore speaks to another oppressed group: women. Women of all colors. She took the conversation a step further. The Black Lives Matter Movement has been disrupting business as usual from city to city across the country for almost two years now. The space is open and Beyonce, the artist, is performing a reflection of society, something art is supposed to do. But the image she portrayed by dressing as Black Panthers, and using the Black power fist, and even referencing Malcolm X is a direct threat to the racist, oppressive system that the ruling class is trying to maintain. Yet critics said things like she was trying to “attack the police….the people who keep us alive.” They must have forgotten how the police kill almost three people a day in this country and more than half of them are black and brown. We saw the far right react with their usual xenophobic, racist ways with protests under the hashtag #BoycottBeyonce. While the Black Lives Matter Movement has brought back to life a conversation about racism and police brutality, it is yet not following where the great civil rights leaders of the ‘50s and ‘60s left off. By eliminating economic demands from the fight for black freedom, we weaken the movement and prolong the struggle. But where is the rest of the program? We need a program on education, on wages. On housing and the environment. Black people are shut out and priced out every day, and all these things hit us hardest. But to take on a program like that would mean to take on a working class agenda as part of the fight against institutional racism. 2016 marks the the 50th anniversary of the creation of the Black Panther Party. Although in Bey’s halftime show the Panthers were sexualized, two-thirds of the Black Panthers were women. With most of them between the ages of 17-21. Organized in major cities, they fought for a socialist ten point program. They fought to end police brutality. But they also fought for full employment of black people, free health-care, quality housing and education. They adhered to Marxists ideas and fought for the liberation of an oppressed people through an organization built to unite working people, specifically workers and youth of color. Back in the sixties, the Panthers focused on protecting black people from police brutality. When they saw a black person pulled over by the cops, they would monitor the event – often times with weapons in their hands. The ruling class understood the potential of socialists linking up with broader sections of the working class and tried to portray them as an armed gang. At times up to 300 Panthers were facing trial and many more were simply murdered in the streets by the FBI. Throughout the life of the Panthers but especially during this brutal state repression, women remained the essential backbone of the party. They continued the work of community programs and proved themselves to be great thinkers. Women like Kathleen Cleaver who was on the Panther’s Central Committee, Ericka Huggins, Afeni and Assata Shakur who were important organizers and speakers for the party, did more than just stand with the men. The Black Panther Party represents a time in the history of black and brown folks, and really the working class of the U.S., of leadership and organization. It represents the rise of consciousness among young people of all colors. We are currently seeing now a new generation of the working class, youth and most oppressed radicalized around issues of racism and state-sponsored violence. The standard of living for black people has plummeted during Obama’s presidency and people are being killed by cops on a daily basis. Our current movement needs to learn from our history. We need a political party of the working class, poor and youth, the 99%. A party that is looking to build a multi-layered leadership, that can agitate, lead workers and youth into struggle. A party that remains independent of not only the two parties of Wall Street but big business money as well. Our movement needs to put up our own candidates wherever possible. Our movement needs not only to rely on hashtags and music videos but we need a sustaining mass movement organizing in our workplaces, communities, and schools to challenge capitalism and institutional racism. Women will never be liberated under capitalism, so we fight must like hell against all forms of sexism, misogyny, and homophobia – tearing down the walls of capitalism. All Stand In Formation!! !